If you're hosting an Italian wedding or getting married abroad in Italy, you'll find plenty of options for blessings. Work them into the ceremony or the reception to celebrate your marriage. At a religious ceremony, the priest, rabbi, pastor, or other religious leader will often give the official blessing required by the order of service for the particular faith. Blessings and sayings that are additions outside of the traditional religious ceremony may be read by honored guests. At a secular service, the officiant or a special guest may offer the blessing or saying. The Roman Solemn Nuptial Blessing is one often given during Catholic weddings by the presiding priest. The Berkley Center for Religion, Peace & World Affairs notes that over 80% of Italians call themselves Catholic. It is an old blessing, according to Wedding Rites: The Complete Guide to Traditional Vows, Music, Ceremonies, Blessings, and Interfaith Services by Michael P. Foley. The prayer, which is outlined in The Order of Celebrating Matrimony (p. 21-23), begins "O God, whom by your mighty power, created all things" and goes on to exalt God and call upon the Holy Spirit's help to the couple who are now joined. Marriage Rites (p. 107) says there are certain rules that need to be followed for adding this to your ceremony, so be sure you discuss this with your priest during your planning sessions. Work a lovely saying about the joining of the couple by having someone special recite "Dio li fa e poi li accoppia." Author and Italian expert Lisa Shea has translated as being about the man and wife being made and joined by God. This is a lovely option to start a blessing at the beginning of a sermon, homily, or reading during the ceremony. The book Marriage Rituals Italian Style: A Historical Anthropological Perspective on Early Modern Italian Jews by Roni Weinstein provides a look at a prayer recited by the groom at an Italian Jewish wedding. The blessing in the Marriage Rituals book (p. 370) should be said under the wedding canopy and begins "May my canopy, though low and humble, find pleasure and acceptance. . ." It goes on to ask for blessings for the couple as they join under the canopy. It should be done at the appropriate moment in the ceremony according to the presiding rabbi. The reception is usually a more light-hearted than the ceremony, so you don't need to select traditional Italian wedding sayings or blessings that are as solemn. 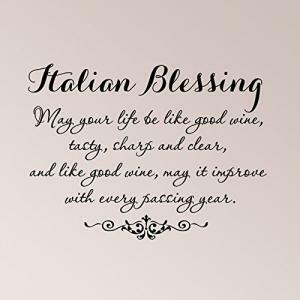 The Italian blessing that begins "May your life be like good wine" is one perfect for ending a wedding toast at the reception. It also works well for a pre-dinner saying for secular couples and their officiant. It goes on to say that as the wine ages and perfects itself, so will the marriage. Add a small blessing to the favors you pass out. Five sugared almonds are traditional Italian wedding candies. The blessing by Jill Girardo that can accompany them starts with "Five sugared almonds for each guest to eat" and continues to offer the five blessings for the couple. For more ideas, you can check with your Italian wedding officiant or planner. He or she likely has accumulated several Italian wedding blessings, poems, or proverbs for you to select from for the ceremony. A brief wedding blessing or wishes is appropriate at the reception as well.